Using guided imagery, meditation, shamanic ascent, we open the doors of the imagination to the theater of revelation. Utilizing basic materials -- graphite, colored pencils, pastels, and watercolors -- we commit mental pictures to paper and discuss the aesthetic dimension of our mystical experiences. An illustrated talk on the worldwide visionary art movement will prepare us for vision practices, art meditation, and group interaction that empowers the process of realizing our heart’s iconography to outer form. 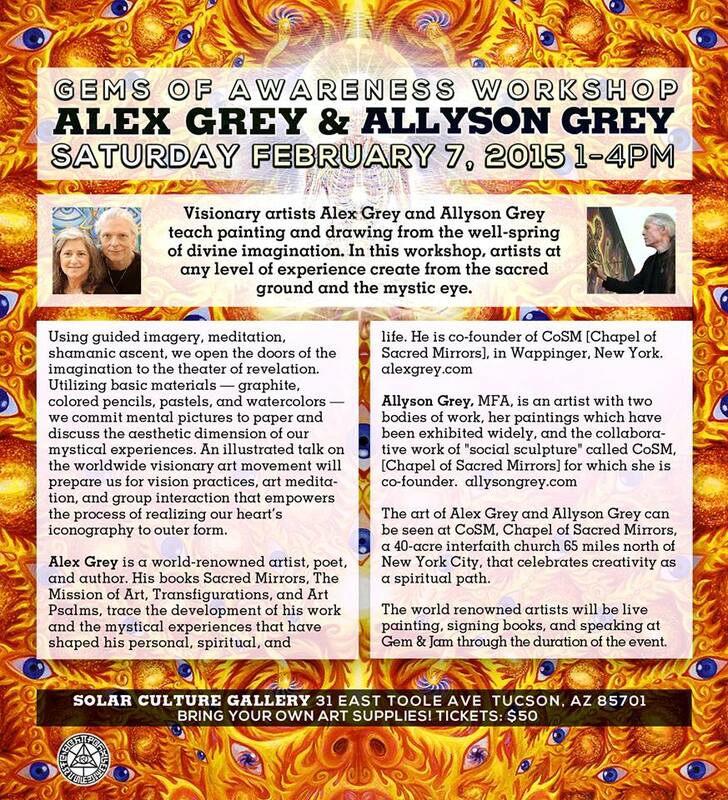 The art of Alex Grey and Allyson Grey can be seen at CoSM, Chapel of Sacred Mirrors, a 40-acre interfaith church 65 miles north of New York City, that celebrates creativity as a spiritual path.